Last weekend, after an alert from David Hunter’s gardening centre I spread seeds of kale and green onion. I planted the organic purple max garlic I’d bought on Hornby Island (ate 8 of the 10 I bought and was saving the two for planting). And to make it look a little prettier I bought some green onion and red sails lettuce bedding plants. Urban wild life (slugs) and not so wild life (cats) have made a mockery of my efforts. I turned over the rich soil that I’d “made” through planting potatoes and putting sod etc on top, and added extra compost to this little patch that had not been very fertile in the past. 3 Days later I noticed one of the 4 lettuce plants was in distress, so I put slug stuff (David Hunter tells me it’s eco-friendly) around the other three. Actually as an optimist at heart, I put it around all 4, but I knew one was done for. Now this a.m. en route to Wired Monk for morning cuppa, I see there are TWO lettuce plants with lots of slug stuff around them. The third has disappeared. And one of the co-op cats, exited the patch with a guilty look on his face as I walked by. However, there appear to be teeny, tiny little kale sprouts emerging. On a different gardening front, thanks to Doris Anderson, one of the Neighbourhood Small Grant recipients in Kitsilano, I learned about microgreens and ordered a year’s supply of seeds from Saskatchewan. After various places and systems in my tiny apartment, I think I’ve found a winner. I’m planting the seeds directly in the two south-facing window boxes and covering with the lids of organic greens (the tall boxes). I can spray the seeds, or just water and this seems like a low-maintenance approach. I’m wanting to believe the people who say you can just leave the little rootlets in the soil and add more seed as time goes on. I’m curious about why it seems the seeds farthest from the building (therefore 2 inches closer to the sun) seem to be doing better than the part closest.) It’s nice to have an autumn gardening experiment. We had a meeting last night to determine the final allocations for our Neighbourhood Small Grant, and dreamed up the idea of making signs for Kits gardeners to put in their garden – to encourage good citizenship, community building and of course bees and butterflies. The problem is that many Green Streets gardeners (those intrepid volunteers who plant, water, weed and generally tend to traffic circle/roundabout and corner bulge gardens) often report with dismay that people have cut flowers “for their eyes only” or worse yet, actually dug up newly planted items. I think friendly, heartfelt signs work better than what a professional sign-maker friend of mine calls the “no, no, no, no, no” signs. So we’re brainstorming possible signs with a humorous and/or heartfelt twist and will print and laminate them for Kits gardeners to put in their gardens – or of course, we’d be delighted if they “stole” the idea,too. So far we’ve come up with a lot of bee-puns such as: Bee-You-Tee-Ful and leave the plants for all to enjoy, Bee-Have yourself–Enjoy but don’t pick; Isn’t this garden just the Bees’ Knees? “Like” if you agree, but please don’t pick. The last 5 people who picked flowers here were stung by bees within 24 hours. Just sayin’. To the people who took our plants: You may think because we live in Kitsilano we’re well off, but in fact we’re 4 students who pooled our money to beautify our neighbourhood. The 6-year old who put it there misses Pinkie, the pink flamingo. Please return. Hope to see you for our third RoundAbout Kits workshop during the Khatsahlano Festival (July 13). We’ll have a booth at the corner of Trafalgar and 4th Avenue, teaming up with a few other Neighbourhood Small Grant recipients. Then we’ll have a windup walk and party on Sunday August 25. Register here. 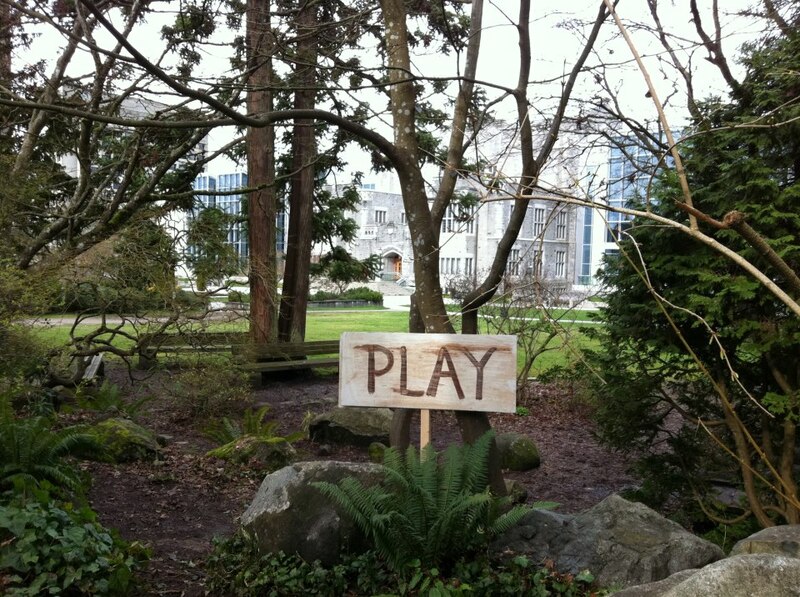 During Khatsahlano, we’ll make a neighbourhood map with special gardens marked on it. If you have a garden that’s friendly towards bees, butterflies and community – come and put it on the map! We had 15 delightful people for our first workshop. Some very creative signs got designed and excellent connections made. I’m particularly happy to have given away more lambs’ ears and lemon balm. Watch for the signs – or make your own. FREE workshop Saturday, May 25, on making gardens friendly. A friend who was a professional sign-painter for a municipality said they often made what he called the “no-no-no-no” signs.You know the kind: no pets. no kids. no ice cream. no cappuccinos. At our workshop this Saturday, we’re going to make yes-yes-yes-yes signs. I hope people will be inspired by my “please pick herbs” sign and want to enhance their garden with friendly signs. I’ll post some examples of signs made by others,that might get you started. Oh, how exciting. 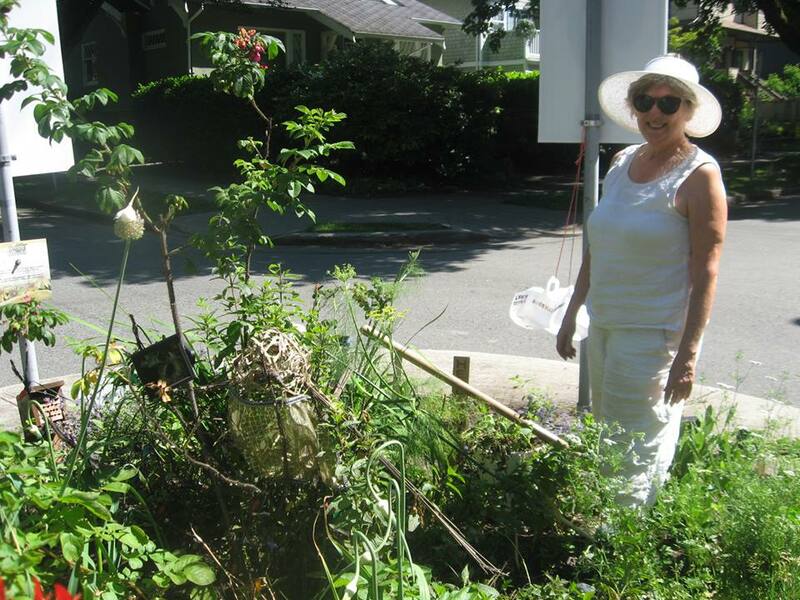 CBC TV Reporter, Bob Nixon, visited my RoundAbout garden at 6th & Trafalgar today and it was included along with Broadway and Balsam gardener Elayne Armstrong in the evening news along with a profile of the (fabulous) Green Streets program. Turns out Bob is a beekeeper. So we got along just fine! Oh, and I got to wear my Corvus Fittings bamboo sunglasses throughout (designed and distributed by my son). Click here for the CBC TV clip. Mary-Go-Round, the new name for my RoundAbout garden (traffic circle) at 6th & Trafalgar presents: Herb of the Month. You can’t pick this too much – Go crazy. And if you want a plant of your own, just dig a bit up and give it a good home. Pinch a bit and sniff it. Take some home to clip for salads or tea. Doesn’t dry well – Use fresh. Cover tightly and chill for 1 hour until flavors have blended. In small dish, combine first 2 ingredients, press mixture with back of spoon to blend. In large mixer bowl, cream butter and sugar until light and fluffy. Beat in egg and lemon mixture. Gradually beat in flour and salt. Cover and refrigerate 3 hours or until firm. Roll in wax paper. Preheat oven to 350°F. On wax paper slice into slices about 1/8″ thick. On ungreased cookie sheet bake 8 to 10 minutes. Will brown slightly around edges. Scrub the lemons well. Peel the rind thinly, avoiding the white pith, and set aside the lemons. Place the lemon rind, lemon balm leaves, and the sugar into a small heat-proof pitcher. Pour the boiling water into the pitcher and stir well, crushing the lemon balm leaves to release their flavor. Leave mixture to infuse for about 15 minutes. Cut the lemons in half and squeeze out the juice. Strain juice into a large glass pitcher, add a few fresh sprigs of lemon balm, and add the cooled, strained syrup. Top up with water or half-water half-ice, and chill until needed. for the featured herb each month – including recipes.